Creamy pumpkin oatmeal is packed with protein and nutrients with just the right amount of pure maple syrup for sweetness. Oh did you think I was kidding when I said how much I loved pumpkin? Obsessed might be a but of a understatement. Pumpkin is a low calorie, flavor-packed ingredient that is not only affordable but extremely versatile. Recently I shared ways to use pumpkin in smoothies, mac and cheese, granola bars and gluten free pancakes and today I’m sharing another favorite: pumpkin oatmeal! My love for pumpkin oatmeal is the result of having leftover pumpkin in my fridge. I don’t know about you but most pumpkin recipes only call for 1/2 – 1 cup of pumpkin. Inevitably, I always have a little leftover that I stash in the fridge for a later time. Adding pumpkin to oatmeal not only adds a beautiful color but it adds vitamins, nutrients and a thick and creamy texture that can’t be beat. Of course, it doesn’t hurt that it also tastes like pumpkin pie. 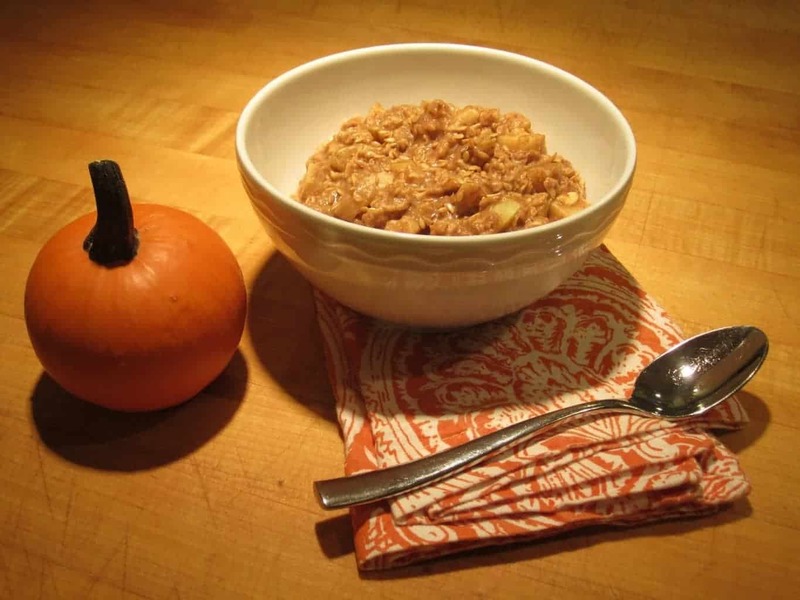 Creamy pumpkin oatmeal is packed with protein and nutrients with just the right amount of pure maple syrup sweetness. Bring water and spices (cinnamon through salt) to a boil whisking occasionally. Stir in oats then return to a boil. Reduce heat to low and cook until liquid is absorbed, about 6-8 minutes. Stir in pumpkin, syrup, walnuts and chia seeds. Cook additional 2-3 minutes or until pumpkin is warmed through. I want your version right now!!! Do you think I could make them and reheat them, I would be the only one eating them. Absolutely! They reheat very well! Enjoy! Lol, that e-card! Too true. This oatmeal looks so darn delicious, Liz! I’d definitely love to wake up to a big bowl for breakfast. Thanks for sharing! haha…it really is true!! :) Thanks so much Georgia!! Oh good I hope you like it Christy!! I love that you love da pumpkin!!! Bring it on sister. Oh, and anything with chia seeds rules!! 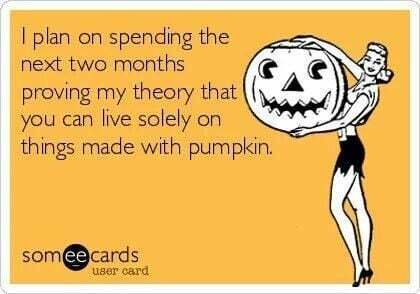 I just can’t quit pumpkin!! What a great idea Liz! I just had oatmeal this morning and I wish I would’ve thought of this! Genius! Eeeeeek I have so much leftover pumpkin in the fridge! Lately I’ve been whisking a couple tablespoons into almond milk with some pumpkin pie spice and maple syrup combined with coffee for a quick little wannabe PSL. There’s seriously so many delish pumpkin recipes out there right now that I can’t decide what to use my precious pumpkin on! I looooove chia in oats–I add a tablespoon every time! Can’t wait to try. Making this for breakfast asap!! This looks so creamy and decadent! I love oatmeal and pumpkin soooo much! Fantastic breakfast! Pumpkin makes it SO creamy!! Enjoy! Me too!! I hope you like this Christy! Once I started doing it I never looked back. So rich and creamy but healthy!! I seem to always have leftover pumpkin in the fridge too! Now it’s getting put to good use. I love how creamy this looks–oatmeal needs to be creamy! hahah I do too!! That’s why I started doing this! Plus it adds so much nutrition. Enjoy! LOVE this! What a fabulous fall breakfast idea! Thank you Anna!! So simple but really delicious. 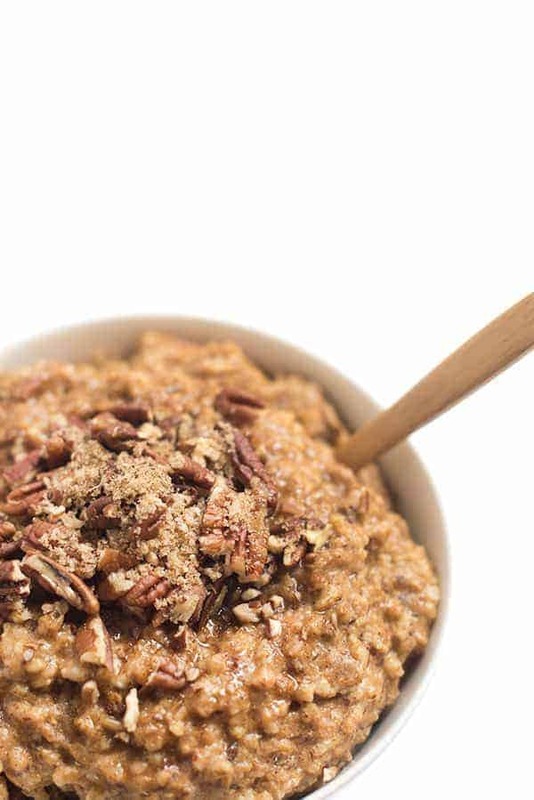 This oatmeal sounds so good and like the perfect way to start the day. I recently opened a humongous can of pumpkin and have slowly been working my way through it. I can’t wait to try this creamy and festive recipe! Oh yeah!! 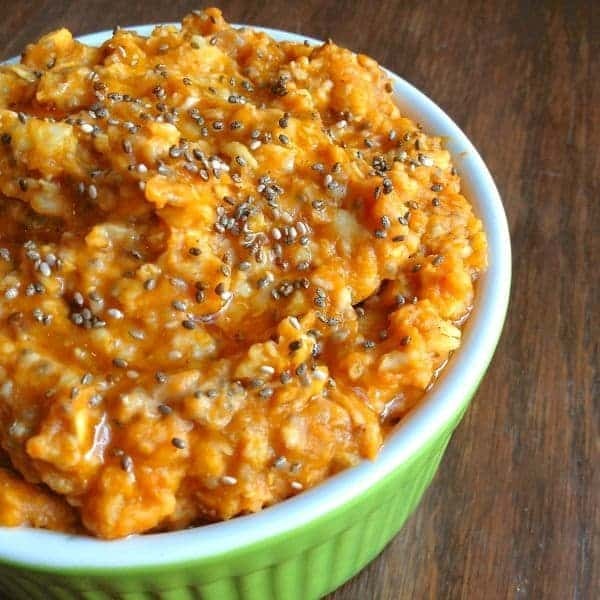 Pumpkin oats are one of my favorites!